No Country for Old Men (2007): Written and directed by Joel and Ethan Coen. 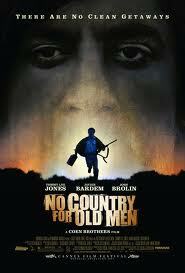 Based upon the novel of the same name by Cormac McCarthy. Starring: Josh Brolin, Javier Bardem, Tommy Lee Jones, Kelly Macdonald, and Woody Harrelson. Rated R for strong graphic violence and some language. Running time: 122 minutes. With its pitch-black tone and philosophical skirmishes, No Country may have passed over the Academy’s head entirely if not for its lingering familiarity with the filmmakers, who gained fame and success with their 1996’s Fargo. With No Country, the Coen Brothers continued their exploration of money-politics while testing new themes of circumstance and fatalism. In early 1980s Texas, a welder named Llewelyn Moss stumbles upon $2 million in the aftermath of a drug deal gone awry. Moss thinks he can take the money for himself, but finds himself pursued by the relentless mercenary Anton Chigurh. Meanwhile, a local sheriff attempts to make sense of it all. The film boasts meticulous craftsmanship, from its overall structure to its smallest moments. Every shot, every action, and every scene transition feels deliberate and sure. It entertains as a nail-biting thriller while boasting the intellectual acuity one expects from the Coens. In fact, its thrills are integrally linked to its bigger ideas; a life-or-death coin toss between Chigurh and a gas station owner turns into a conflict between unknowable evil and and old world folksiness. And despite their skills, Moss and Chigurh must also contend with pure chance as a combatant, which only ups the tension. As one might expect, No Country contains an embarrassment of exceptional work from its cast. Javier Bardem has all the eerie determination of fate itself, but occasionally lets some amusement dance behind his eyes. But everyone around him, including underrated turns by Josh Brolin and Kelly Macdonald, color the world with truthful nuance. As do the smaller characters—shopkeepers, motel owners, and even animals. They make the incredibly attuned (if minimal) script play like a lute on the ear; taken mostly from Cormac McCarthy’s novel, it feels unmistakably Coen-esque. Some have dismissed the film as a technical exercise, but they ignore the hope and humanity amidst the tightly-choreographed violence. I’m surprised No Country captured the big prize, but I’m glad it did, if only for my chance to revisit a masterpiece.